"You are right," the Angelic figure confirms, "you have only one last step on your journey, one final step to completion. But you cannot take that step until you lay your past to rest." The Fool is perturbed. "Lay it to rest? I thought I'd left it behind, all of it!" "There is no way to leave the past behind," The Angel observes. "Each step wears down the shoe just a bit, and so shapes the next step you take, and the next and the next. Your past is always under your feet. You cannot hide from it, run from it, or rid yourself of it. But you can call it up, and come to terms with it. Are you willing to do that?" The Angel hands the Fool a small trumpet. The Fool is hesitant, but he knows that the Angel is right. There are certain memories he has a hard time looking back on as they make him feel guilty, ashamed, angry. He knows that he's never come to terms with what happened and he must if he wants to make that final transition. He blows the trumpet and it cracks open the Earth. From under the Fool's feet, the spirits of his past selves rise up, including those less than admirable past selves that he's tried to forget. With Fire as its ruling element, Judgement is about rebirth and resurrection. The idea of Judgement Day is that the dead rise, their sins are forgiven, and they move onto heaven. 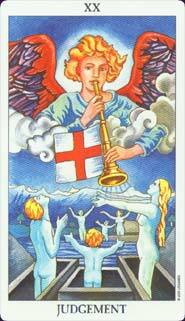 The Judgement card is similar in that it asks us to resurrect the past, forgive it, and let it go. There are wounds from the past that we never let heal, sins we've committed that we refuse to forgive, bad habits we haven't the courage to lose. Judgement advises us to finally face these, recognize that the past is past, and put them to rest, absolutely and irrevocably. The reader can tell the querent that they need to forgive or be forgiven, do something they've been putting off, or have the courage to finally end something that isn't good for them. It is time to move on. This is also a card of healing, quite literally from an accident or illness. It can indicate a time in the hospital, or a time of significant change. Judgement can be a hard card to read; it usually signals a change, one that involves leaving something old completely behind and stepping into something completely new. Like closing the door on an old job, and opening the door to a new and very different career. But it's also about making a final decision, to take that plunge into the new career, to forgive your family, to leave an abusive spouse, to make a new life. To heal and renew. 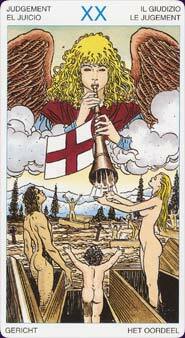 It's a very hard card to read, in part because it deals with very hard and final decisions. And it means facing something that most querents don't want to face. This is not about Death, something ending whether you want it to or not, this is about deciding to make a change, to stop doing something that isn't working and do something that will work. Which means that it's really a card about courage, and about recognizing that you're holding onto something that needs to be let go. "You can't hide any longer," this card says, "All the coffins have opened, and all that you thought was buried is out in the open. Face what you have to face and lay it to rest so that you can move on. Make that decision. Change." Learn the Judgement tarot card meaning and the rest of the card meanings, symbols and stories in our eBook.